As you may or may not be aware I purchased a bottle of 2006 Cristal Champagne; a champagne that has been on my bucket list of must try champagnes for a number of years and went in search of a restaurant over the festive season to take it to so that we could enjoy it together! Well what a journey we went on to achieve this goal! A number of restaurants that we contacted flat out refused and then one was going to charge us $20 each for corkage to bring it along…really, when on other nights they told us corkage was $10 to then say that they would allow us but double to corkage price..no thanks! In the end we decided to approach one of our local favourite restaurants to see if we could enjoy an evening meal and celebrate the start of a new year with this special champagne and they were gracious and accommodating…so off to Blu Grill we headed! Now you can look back at my previous reviews of Blu to see what we both think about the food, the ambience and the service and it was once again at the top of its game in terms of the service and also the feeling in Blu is of a real casual elegance. The menu has changed a little since we were last there with a few new additions and some old favourites still on the menu. It is by no means an extensive menu but the quality of the food and the presentation are first class and I challenge you not to find something that you would enjoy! But first to the champagne… it was full and resonant on the palate, the 2006 Cristal dazzles with its pure richness and volume. It was opulent and intense, layered and deep. This is a fabulous showing for this champagne and if I could afford it I would be drinking it all the time! It was a pure delight and each sup was pure delight. 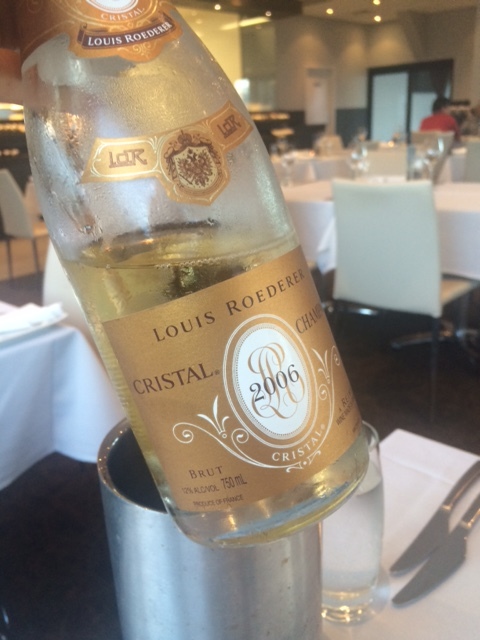 I was lucky to have purchased my bottle through the Perth Champagne Club who were offering it at $295 per bottle which is a greatly reduced price for the 2006 Cristal and it was worth the price! Now to the food that we had on this visit. It is always hard for me to go past the rabbit rillettes and stayed true to form and ordered that, whilst Trevor ordered the mixed mushroom and bocconcini bruschetta with cherry tomato, cos lettues, quinoa, basil and goat cheese cream and drizzled with tapenade oil. He loved the bruschetta and I snuck a corner and we both agreed it oozed flavour and had a caramelised finish that added a complexity to the dish. 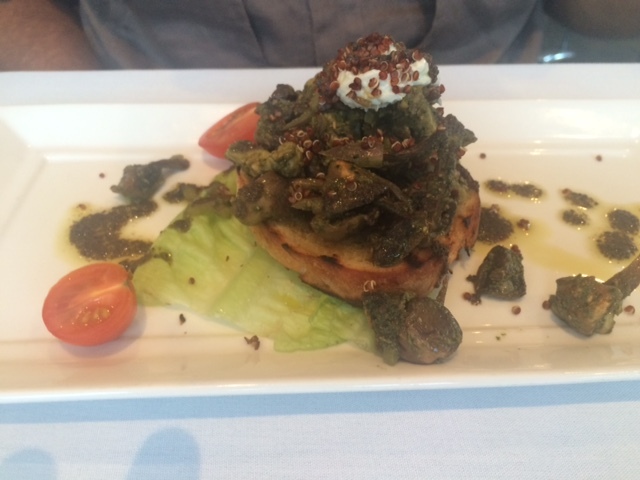 This was not like any usual bruschetta and it was a really delightful dish. 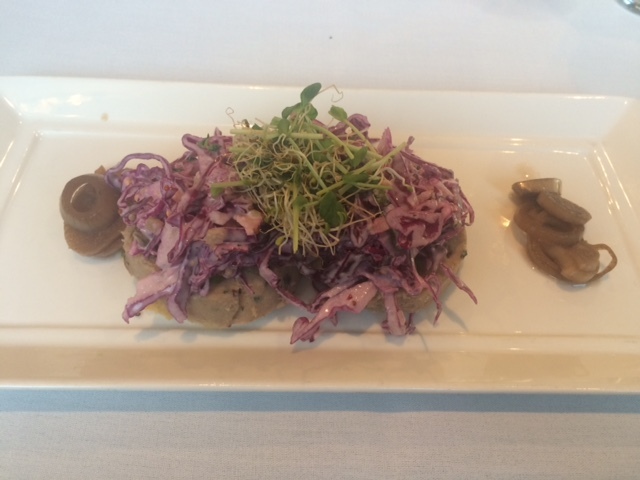 wholegrain mustard, crostini and pickled shallot in balsamic and as per usual were a refreshing tasty dish. The rillettes were perfectly cooked and presented hand had that complex combination of the rabbit and the butter mixed together perfectly. It was a perfect French summer dish to have and it went together with the Cristal just perfectly. It will be hard for me to go past this dish when we next dine at Blu. 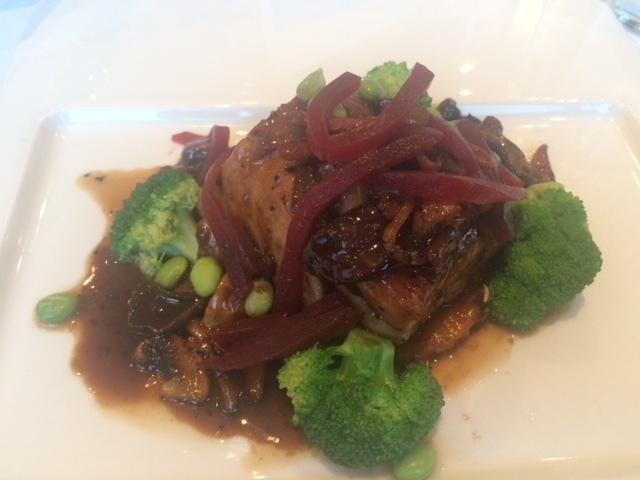 For the main course I chose the tequila flambéed pork fillet with mixed mushroom, celery and sweet potato mash, pancetta, blanched broccoli, roast baby beetroot, endamame beans and a sweetly seductive marsala sauce. The pork was cooked to perfection and the accompaniments were all perfectly balanced to add some extra flavour, texture and tone to the dish. It was beautifully presented as well. flavoured with cumin and shaved parmesan cheese and just the right amount of spicy added to give it a lasting kick. 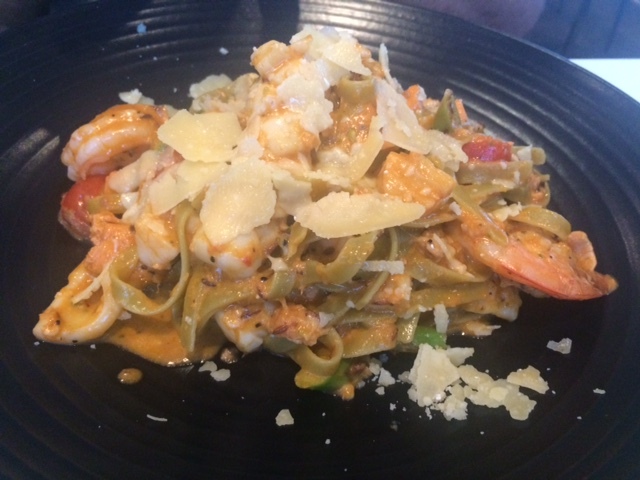 This homemade fettuccine was really delicious and had just the right blend of seafood to add some real substance to the dish. The asparagus was al dente and the cumin shone through the bisque to add another dimension to the dish. The night was just perfect and the Cristal just added another level to the night. Lets take a little more time caring for each other in 2015!